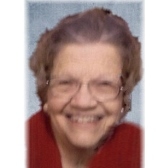 Lois Marie Porter, 88, of Hopewell died 3:45 AM Friday, April 12, 2019 at the Genesis Hospice Morrison House. She was born April 13, 1930 in Hopewell the daughter of Bernard S. Porter and Marie Winegarner Porter. Lois graduated in 1948 from Hopewell High School and was active in planning for her class reunions. Lois then graduated from Meredith Business College and retired after 45 ½ years of service from General Electric in 1995 as an executive secretary. She volunteered at Bethesda & later at Genesis Hospital at the information desk from 2001 until 2012 and having served over 4600 hours. Lois was also active with the restoration efforts of Poplar Fork Cemetery, especially with preserving the Arch. She had a love for birds, especially hummingbirds. She also enjoyed spending time with her friends at Primrose Retirement Home. She is survived by her nieces; Janice (Wayne) McMillan, Ruthie Ware, and Karen (Tom) King and several great nieces & nephews; a niece-in-law, Jenny Porter; and numerous friends including, Pat James, Jane Wiley and Hanna Hagan. Lois was preceded in death by her parents; a brother and sister-in-law, Daryl and Rose Porter; a sister and brother-in-law, Helen and James Walser; a nephew, Steven Porter; a niece, Kathy Walser; and a nephew-in-law, Wendell Ware. Friends may call 4:00 PM to 7:00 PM on Monday, April 15, 2019 at the Bryan & Hardwick Funeral Home. Funeral service will be held at 11:00 AM Tuesday, April 16, 2019 with one hour visitation prior to service at the Bryan & Hardwick Funeral Home with Pastor Chris Steele officiating. Burial will conclude at the Poplar Fork Cemetery, Gratiot, OH. Memorial contributions can be made to Genesis Morrison House Hospice. To share memories and condolences with Lois’s family please click on the Guest Book link on this page.